The 2011 Chevrolet Volt received not one but three different mileage ratings from the U.S. EPA today. 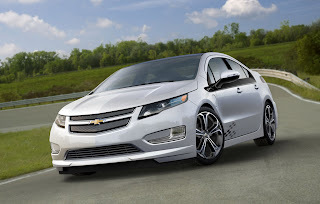 General Motors Co. has been touting the Volt for four years now and often refers to it as a technological showcase. The four-passenger car can travel on battery power alone and offers additional driving range when assisted by a 1.4-liter gasoline engine. The car has already received numerous awards, including Green Car Journal's Green Car of the Year. 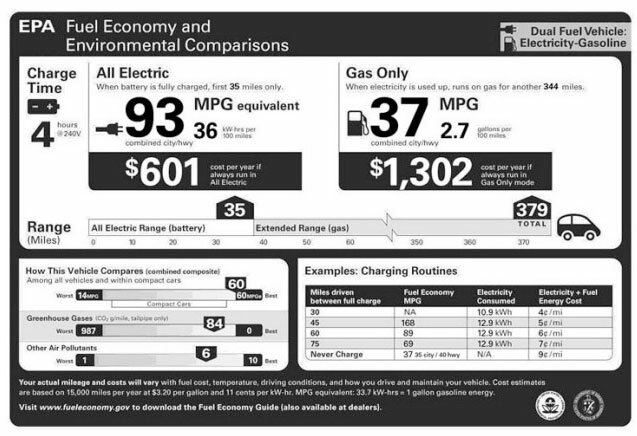 The EPA said the Volt has a 35-mile range on electricity alone and a range of 379 miles with gasoline and electricity. GM had been saying that the Volt had a range of 35-50 miles on one full battery charge. “We have said that the range is variable on how you drive,” Doug Parks, GM's vehicle line executive in charge of the Volt, said during a conference call today with the press. The Volt falls into the EPA compact vehicle segment, which includes such vehicles as the Ford Focus, Chevrolet Cruze and Toyota Corolla.The Volt's mpg rating was rated as best in the compact class by the EPA. The label lists what it calls “charging routines,” essentially estimates for the cost of electricity and gasoline based on the number of miles driven between charges. For example, a Volt owner living in an urban area who travels 30 miles between charges, would use no gasoline, the EPA estimates. The vehicle would consume 10.9 killowatts of electricity for an estimated cost of four cents per mile. That contrasts with a Volt owner who travels 75 miles between a charge and uses gasoline. The EPA estimates 12.9 killowatts of electricity would be used, in addition to gasoline, for a combined estimated cost of 7 cents per mile. The EPA estimates fuel economy at 69 miles per gallon.